Got a finished product but no budget to start marketing it? Just interested in learning some new free growth tricks? 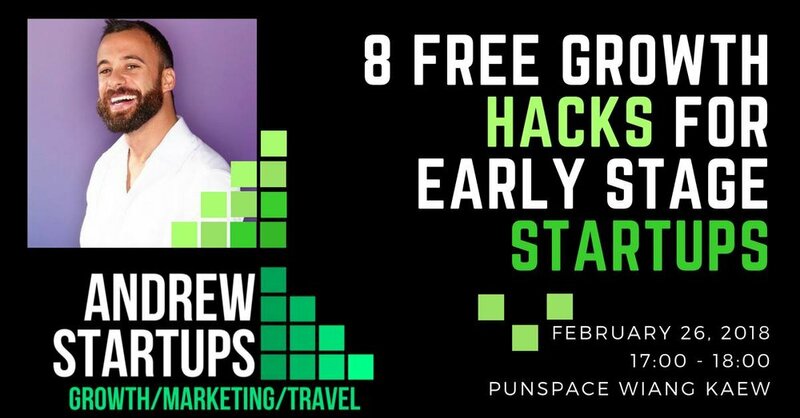 Join @AndrewStartups, a 12-year startup marketing veteran who's driven growth for 3 multimillion dollar exits with low budgets and been head of marketing for projects from Dubai to Silicon Valley, as he teaches you his top 8 free traction hacks. Learn about how to leverage social media, press marketing and other proven strategies to get your project off the ground without a budget! Andrew has spent the last decade building growth for tech companies in Dubai, San Francisco, Sydney, Prague, Phuket, Puerto Vallarta and more. After his 3rd exit as head of marketing he became a full time remote marketing consultant at www.andrewstartups.com and now assists companies whilst being a Digital Nomad on the road! วันเวลา: วันจันทร์ ที่ 26 กุมภาพันธ์ 2561 เวลา 17.00 น. - 18.00น.